The first of the very large planning applications lining up to take advantage of the proposed Old Kent Rd Opportunity Area goes to Southwark’s planning committee on Monday 29 October. It is for a mixed-use scheme that would include 1152 homes, with 40.5% affordable housing, two-thirds of which would be social rented. A publicly accessible sports hall/gym and ‘pocket park’ are also promised. The scheme dubbed the ‘Ruby Triangle’ is proposed by a joint venture between A2Dominion Housing association and recently-formed developer Avanton Ltd, which is chaired by former defence secretary Sir Michael Fallon. Despite the affordable housing offer, the application has nonetheless excited much passionate opposition. The site is designated by the Mayor as a SIL - Strategic Industrial Location and the loss of industrial workspace is contrary to the local plan. The proposed development has 3 towers, one of 48 storeys, another of 40 storeys. The VitalOKR group, a coalition of residents, businesses and community groups, have objected to the loss of industrial land and impact on jobs. Thirteen businesses and a church currently occupy the Ruby Triangle site. Among the businesses is a waste recycling facility (Southwark Metals), which has been recycling metals on the site since 1980 and a data management company that lists both Southwark Council and the GLA amongst its clients. Another business ‘Constantine Ltd’ employs 130 local people and provides fine-art logistics to clients such as the Natural History museum and the Tate. It has lodged a formal objection to the planning application, claiming that the developer has made little effort to engage about alternative premises and surrender of their lease which runs for another 10 years. Objectors point out that, while 40% affordable housing appears generous, the threshold for affordable housing is 50% for SIL sites in the Mayor’s draft New London Plan. Local residents in the neighbouring Canal Grove Cottages fear loss of daylight, and the detrimental impact on the local environment of a scheme that is nearly four times denser than the local plan allows (2,701 habitable rooms per hectare against a maximum 700h hbr per hectare)1. Related to this, there is no information on whether any of the 1,152 dwellings proposed comply with the BRE’s minimum daylight requirements - a requirement of Southwark’s planning policy2. In its report to planning committee, Southwark’s Design Review Panel (which reviews all major developments on the Council’s behalf) raised concerns about the lack of sunlight/daylight analysis and expressed serious reservations about the architectural quality of the scheme in general, not least because a very high proportion (50%) of the new homes will be single aspect (10% north facing). The Mayor’s new London Plan says that schemes should “avoid the provision of single aspect dwellings” (Policy D4(E)). The Design Review Panel’s report concludes: “The Panel challenged the Applicants to review their proposals and to address their concerns and invited them to return to the DRP in advance of a planning application.” Despite this the application is going to committee without the plans having been reviewed and re-assessed by the Review Panel. The Design Review Panel said that it was “also concerned that part of the ‘green heart’ that is being proposed as a key public benefit of the scheme, falls outside the site boundary”. The site ownership boundary plan submitted by the developer shows that more than half of the proposed ‘pocket park’ is located on land that it doesn’t own. A seperate successful planning permission from the neighbouring landowner would be needed to deliver the whole park, presupposing that they actual want they to develop the land and include such a park. This echoes objectors’ fears that developers and Southwark are getting ahead of themselves. The Opportunity Area (and accompanying area action plan) has not completed its own progress through the planning system; a public inquiry (EiP) that examines the Opportunity Area’s merits and makes recommendations for amendments is not due to be heard until the new year. The 35% Campaign is always pleased to see a development that offers more affordable and social rented housing than the local plan stipulates, but where more affordable housing is required, and it is 50% under the emerging, draft London Plan, that should be delivered. Closer inspection raises some other concerns. There is an ambiguity over the social rented housing; the application and officer’s report refers to social rented housing, yet the GLA Stage 1 report refers to same units as ‘affordable rent’, which can be up to 80% market rent. The GLA Stage 2 report is not available at the time of going to committee, a departure from usual practice. The involvement of housing association A2Dominion as a development partner in the scheme also rings an alarm bell. They featured in our successful complaint to the Ombudsman about tenure switching, where affordable rent was substituted in developments where social rent had been approved, in this case the Colorama development in Blackfriars where A2Dominion acted as both developer and registered provider. 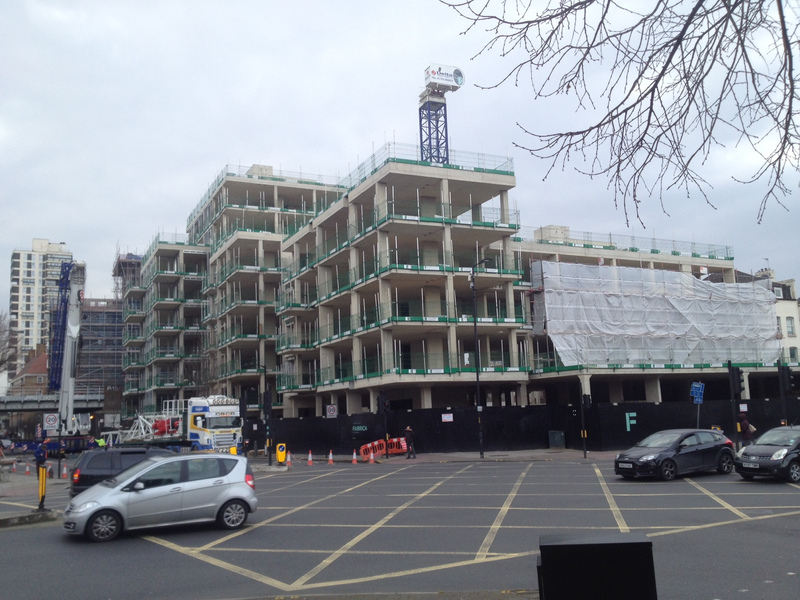 A2Dominion, was also subject to a planning breach investigation from Southwark Council for its development at 166-178 Camberwell Rd, which has stood half-finished since 2015. Profit vs affordable housing - what’s reasonable? There is an unresolved dispute about the reasonable level of profit to be assumed in the viability assessment for the private housing. This could have a bearing on the final amount of affordable housing, to be calculated by the late viability review mechanism. Crudely, the higher the profit the less that is left for affordable housing. The developer wants 20% profit on GDV (Gross Development Value), while the Council’s independent assessors’ report argues that this is too high and that 17.5% is reasonable. This is backed up by the Council’s own viability study commissioned for the OKR AAP, which assumes a developer profit of 18% (para 4.39). In cash terms Southwark’s assessor gives £73.8m as a reasonable profit for the private housing. According to their own viability assessment, where the profits are listed as ‘miscellaneous fees’, the developer’s 20% profit target amounts to £92.21m for the private housing, providing an overall profit assumption of £101.36m, when profits for affordable housing and commercial premises are added in. A peculiarity of the Southwark assessor’s appraisal of the viability assessment is that it concludes ‘that the proposed scheme would not be viable with a 35% affordable housing offer…, but that ‘stand back’ analysis (using evidence of local land sales with planning permission to ascertain a price per habitable room) indicates that it would be deliverable’. 3 This raises the question of how useful the viability assessment can be, if its conclusion can be discarded and an alternative (undisclosed) ‘stand back’ analysis, with a different conclusion, is depended on instead. Reprovision of recycling facilities - at whose cost? The capital has a shortage of waste recycling facilities, so the Mayor’s London Plan stipulates that any waste recycling facilities lost through redevelopment must be reprovided. The planning committee report explains that the Council has bought land in the vicinity in order to reprovide the existing waste recycling facilities (Southwark Metals), but doesn’t say whether this will be at the Council’s or the developer’s expense. We will be making representations to the Council’s planning committee which will decide the application at Southwark Council’s offices (160 Tooley St) at 6.30pm Mon 29th Oct.